A Low Earth Orbit (LEO) is an Earth-centered orbit with an altitude of 2,000 km (1,200 mi) or less (approximately one third of the radius of Earth), or with at least 11.25 periods per day (an orbital period of 128 minutes or less) and an eccentricity less than 0.25. Most of the manmade objects in space are in LEO. A histogram of the mean motion of the cataloged objects shows that the number of objects drops significantly beyond 11.25. There is a large variety of other sources that define LEO in terms of altitude. The altitude of an object in an elliptic orbit can vary significantly along the orbit. Even for circular orbits, the altitude above ground can vary by as much as 30 km (19 mi) (especially for polar orbits) due to the oblateness of Earth's spheroid figure and local topography. While definitions based on altitude are inherently ambiguous, most of them fall within the range specified by an orbit period of 128 minutes because, according to Kepler's third law, this corresponds to a semi-major axis of 8,413 km (5,228 mi). For circular orbits, this in turn corresponds to an altitude of 2,042 km (1,269 mi) above the mean radius of Earth, which is consistent with some of the upper altitude limits in some LEO definitions. The LEO region is defined by some sources as the region in space that LEO orbits occupy. Some highly elliptical orbits may pass through the LEO region near their lowest altitude (or perigee) but are not in an LEO Orbit because their highest altitude (or apogee) exceeds 2,000 km (1,200 mi). Sub-orbital objects can also reach the LEO region but are not in an LEO orbit because they re-enter the atmosphere. The distinction between LEO orbits and the LEO region is especially important for analysis of possible collisions between objects which may not themselves be in LEO but could collide with satellites or debris in LEO orbits. The International Space Station conducts operations in LEO. All crewed space stations to date, as well as the majority of satellites, have been in LEO. The altitude record for human spaceflights in LEO was Gemini 11 with an apogee of 1,374.1 km (853.8 mi). Apollo 8 was the first mission to carry humans beyond LEO on December 21–27, 1968. The Apollo program continued during the four-year period spanning 1968 through 1972 with 24 astronauts who flew lunar flights but since then there have been no human spaceflights beyond LEO. The mean orbital velocity needed to maintain a stable low Earth orbit is about 7.8 km/s, but reduces with increased orbital altitude. Calculated for circular orbit of 200 km it is 7.79 km/s and for 1500 km it is 7.12 km/s. The delta-v needed to achieve low Earth orbit starts around 9.4 km/s. Atmospheric and gravity drag associated with launch typically adds 1.3–1.8 km/s to the launch vehicle delta-v required to reach normal LEO orbital velocity of around 7.8 km/s (28,080 km/h). The pull of gravity in LEO is only slightly less than on the earth's surface. This is because the distance to LEO from the earth's surface is far less than the earth's radius. However, an object in orbit is, by definition, in free fall, since there is no force holding it up. As a result objects in orbit, including people, experience a sense of weightlessness, even though they are not actually without weight. Objects in LEO encounter atmospheric drag from gases in the thermosphere (approximately 80–500 km above the surface) or exosphere (approximately 500 km and up), depending on orbit height. Due to atmospheric drag, satellites do not usually orbit below 300 km. Objects in LEO orbit Earth between the denser part of the atmosphere and below the inner Van Allen radiation belt. Equatorial low Earth orbits (ELEO) are a subset of LEO. These orbits, with low inclination to the Equator, allow rapid revisit times and have the lowest delta-v requirement (i.e., fuel spent) of any orbit. Orbits with a high inclination angle to the equator are usually called polar orbits. Higher orbits include medium Earth orbit (MEO), sometimes called intermediate circular orbit (ICO), and further above, geostationary orbit (GEO). Orbits higher than low orbit can lead to early failure of electronic components due to intense radiation and charge accumulation. In 2017, a very-low LEO orbit began to be seen in regulatory filings. This orbit, referred to as "VLEO", requires the use of novel technologies for orbit raising because they operate in orbits that would ordinarily decay too soon to be economically useful. Roughly half an orbit of the ISS. A low Earth orbit requires the lowest amount of energy for satellite placement. It provides high bandwidth and low communication latency. Satellites and space stations in LEO are more accessible for crew and servicing. Since it requires less energy to place a satellite into a LEO, and a satellite there needs less powerful amplifiers for successful transmission, LEO is used for many communication applications, such as the Iridium phone system. Some communication satellites use much higher geostationary orbits, and move at the same angular velocity as the Earth as to appear stationary above one location on the planet. Satellites in LEO have a small momentary field of view, only able to observe and communicate with a fraction of the Earth at a time, meaning a network (or "constellation") of satellites is required to in order to provide continuous coverage. Satellites in lower regions of LEO also suffer from fast orbital decay, requiring either periodic reboosting to maintain a stable orbit, or launching replacement satellites when old ones re-enter. Earth observation satellites and spy satellites use LEO as they are able to see the surface of the Earth clearly by being close to it. They are also able to traverse the surface of the Earth. A majority of artificial satellites are placed in LEO, making one complete revolution around the Earth in about 90 minutes. The International Space Station is in a LEO about 330 km (210 mi) to 420 km (260 mi) above Earth's surface, and needs reboosting a few times a year due to orbital decay. Iridium satellites orbit at about 780 km (480 mi). Lower orbits also aid remote sensing satellites because of the added detail that can be gained. Remote sensing satellites can also take advantage of sun-synchronous LEO orbits at an altitude of about 800 km (500 mi) and near polar inclination. Envisat (2002–2012) is one example of an Earth observation satellite that makes use of this particular type of LEO (at 770 km (480 mi)). GOCE orbited at about 255 km (158 mi) to measure Earth's gravity field. The Hubble Space Telescope orbits at about 540 km (340 mi) above Earth. The Chinese Tiangong-2 station orbits at about 370 km (230 mi). The LEO environment is becoming congested with space debris because of the frequency of object launches. This has caused growing concern in recent years, since collisions at orbital velocities can easily be dangerous, and even deadly. Collisions can produce even more space debris in the process, creating a domino effect, something known as Kessler Syndrome. The Joint Space Operations Center, part of United States Strategic Command (formerly the United States Space Command), currently tracks more than 8,500 objects larger than 10 cm in LEO. However, a limited Arecibo Observatory study suggested there could be approximately one million objects larger than 2 millimeters, which are too small to be visible from Earth-based observatories. ^ Sampaio, Jarbas; Wnuk, Edwin; Vilhena de Moraes, Rodolpho; Fernandes, Sandro (2014-01-01). "Resonant Orbital Dynamics in LEO Region: Space Debris in Focus". Mathematical Problems in Engineering. 2014: Figure 1: Histogram of the mean motion of the cataloged objects. doi:10.1155/2014/929810. ^ "Resonant Orbital Dynamics in LEO Region: Space Debris in Focus : Figure 1". www.hindawi.com. Retrieved 2018-07-13. ^ "Definition of LOW EARTH ORBIT". www.merriam-webster.com. Retrieved 2018-07-08. ^ "Frequently Asked Questions". www.faa.gov. Retrieved 2018-07-08. LEO refers to orbits that are typically less than 2,400 km (1,491 mi) in altitude. ^ Campbell, Ashley (2015-07-10). "SCaN Glossary". NASA. Retrieved 2018-07-12. 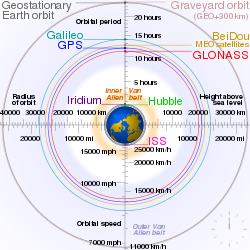 Low Earth Orbit (LEO): A geocentric orbit with an altitude much less than the Earth's radius. Satellites in this orbit are between 80 and 2000 kilometers above the Earth's surface. ^ "LEO parameters". www.spaceacademy.net.au. Retrieved 2015-06-12. ^ Swinerd, Graham (2008). How Spacecraft Fly. Praxis Publishing. pp. 103–104. ISBN 0387765727. ^ Messier, Doug (2017-03-03). "SpaceX Wants to Launch 12,000 Satellites". Parabolic Arc. Retrieved 2018-01-22. ^ Holli, Riebeek, (2009-09-04). "NASA Earth Observatory :". earthobservatory.nasa.gov. Retrieved 2015-11-28. ^ "Higher Altitude Improves Station's Fuel Economy". NASA. Retrieved 2013-02-12.